Since The Mount Magazine came out the other day with a feature on the College Archives, I've made several new friends. My new friends have come bearing information about Mount history, so these phone calls have been wonderfully educational. And some of those "mystery photos" with no information can now be explained. Two of them provide us with a really special coincidence. All archivists, not just Lone Arrangers, struggle with large numbers of beautiful old photographs that lack any kind of "provenance" -- important facts like who's in the photo, what was the occasion, when was it taken, where was it published and who took the picture. Thus we Lone Arrangers are always excited when someone has information. The Summer/Fall 2010 edition of The Mount Magazine has a group of small photographs on the back cover under the heading "Commencement Through the Years." 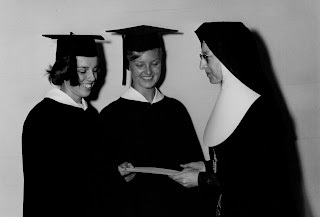 One of the photographs, showing one of the Sisters with a couple of students in cap and gown (top photo, above) is labeled "date unknown." Now, one of the great techniques for dating pictures is to look at clothing and hair fashions. No help here! 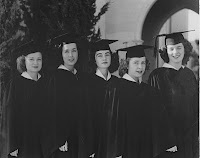 Because the students are in cap and gown and the Sister in traditional habit, the picture could have been taken any time between 1925 and about 1967! So I was tickled when the phone rang and the caller identified herself as the Sister in the picture -- Mary Frances Rebel, or Sister Alfred Mary as she was known in 1955 when the picture was taken. She couldn't identify the students, but she told me that they were all in the nursing program. Sister shared the interesting tidbit that students and faculty wore white for their morning Clinicals, and then the Sisters had to rush back to Chalon to change into black habits for teaching their afternoon classes. "Things were so strict," Sister told me. The next day the phone rang again and it was Helen Antczak Sanchez, '71, whose mother Helen Fitzpatrick Antczak '45, is in the photo labeled "1940s," the second student on the right (lower photo). Here comes the coincidence. When Helen Sanchez was 4 years old, something happened requiring an emergency trip to Daniel Freeman Memorial Hospital, which at the time was operated by the Sisters of St. Joseph of Carondelet. "You know who my nurse was?" Helen asked excitedly. "Sister Alfred Mary! The one in the 'date unknown' picture!" Needless to say, little Helen -- whose aunt Sister Mary Brigid Fitzpatrick '47 was hospital administrator at the time -- received very special TLC from Sister Alfred Mary and the CSJs. Sister Mary Brigid is a Trustee emerita and had a long, wonderful career at the College, and Sister Alfred Mary herself went on to become admin at Daniel Freeman. All these connections are one of the things that make the Mount so special. I'm looking forward to tapping into them more and investigating more of these mysterious photos. By the way, Sister Mary Frances/Alfred Mary offered to come up to the College help go through them, and I'm hoping to take her up on her offer. I am the daughter of Helen Antczak Sanchez. This is a really joyful blog post and I truly appreciate it! It's my first time seeing it. I just wanted to let you know that my grandmother's maiden name was actually Fitzpatrick, not Fitzgerald, same as Sister Mary Brigid Fitzpatrick, CSJ. I think it's very important that the rich history of the CSJs is preserved. I want to make sure that the information you have is as accurate as possible. Once again, I truly enjoyed the blog post you created and am delighted it has brought you as much joy, too. Thanks, Julie! I've fixed the error and am grateful to you for pointing it out. Please let me know of any others you spot. I agree that this is important information to preserve and pass along, which is why I try to keep up with this blog. Thanks again! A Lone Arranger archivist with a digital background managing a paper archives. I answer research questions, create finding aids, manage records and answer all kinds of questions about Mount Saint Mary's history.